As a historical novelist, I realize my #WomensHistoryReads interviews have tended to lean in a fiction-y direction, but I also love to read writers who stick more closely to documented history, like today's guest. (Plus, she actually gets to answer "yes" to the historian question!) 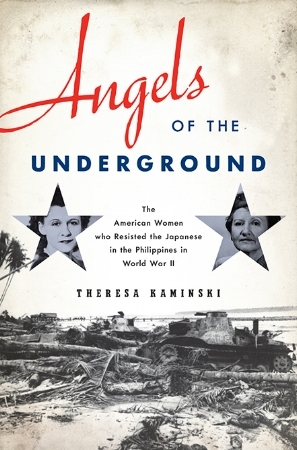 Enjoy today's Q&Q&Q&A with Theresa Kaminski, author of ANGELS OF THE UNDERGROUND and one of the moderators of the excellent Facebook group Nonfiction Fans: Illuminating Fabulous Nonfiction. Theresa: Yes, and I have a diploma to prove it! I could never get enough history classes as an undergraduate so I went on to graduate school. I've been a university professor for 25 years, and I specialize in American women's history. Theresa: Anne Frank. I read The Diary of a Young Girl when I was in 8th grade, and it was the most compelling book I'd ever read. I think that's why I became a historian. I had to know the why and how of the larger forces that drove her family into hiding. Although I ultimately ended up specializing in American history, I am still drawn to stories about captivity. Because of that, I ended up writing three books about American women in the Pacific theater during World War II. Theresa: Pauli Murray (1919-1985) She was a lawyer and a civil rights and women's rights activist. During the 1930s, she took a job with the WPA, and she began a long correspondence with first lady Eleanor Roosevelt. Patricia Bell-Scott wrote a wonderful book about that called The Firebrand and the First Lady. Murray served on President Kennedy's Commission on the Status of Women and she helped found the National Organization for Women. In 1977, she became an ordained Episcopal priest, the first African American woman to do so. Anyone who wants to know more should read not only Bell-Scott's book but also Rosalind Rosenberg's Jane Crow: The Life of Pauli Murray. Greer: Definitely sounds like someone we should know! Theresa: My question for you: What piece of advice would you have given Kate Warne, the real-life woman detective who inspired your book GIRL IN DISGUISE, had you been her contemporary? Would you have wanted to hang out with her? Greer: I would have been a terrible contemporary -- I'm sure I would have discouraged her from going to Allan Pinkerton's office to apply for a job that was clearly meant for men only, and advised her it was too risky to become a detective, let alone a Union spy. The good news is I wouldn't have been able to discourage her. We don't know much about what she thought or why she took on this incredibly challenging role, but we know that she did -- so she had to be bold and daring and unconcerned with what people thought of her. I probably wouldn't have been in her social circles. I'm a pretty boring person. And as they say, well-behaved women rarely make history. Thank goodness for misbehavers like Kate! More about Theresa and her book ANGELS OF THE UNDERGROUND at her website, theresakaminski.com.